“Science fiction is the literature of the future” Robert J. Sawyer dares to say in this article. And not without reason, if we review the main science fiction milestones: getting closer to Mars, improving cognitive and physical abilities of human beings, while these are enslaved by robots created by themselves. In many cases writers and popularizers of science fiction seem to be the raw material feeding engineers and scientists to design the world. This literature seems to seek answers to the Kantian questions of where did we come from? what are we? where are we going? But if that were not enough, technology and science threaten to become the architectural structure that gives them the answer. These ideas of the science fiction writer describe what social media like Facebook and Instagram are like today. The tone, albeit dramatic and even humorous, reflects an everyday reality that already personally affects many of us. What kind of paradigm are many of the ideas of science fiction literature moving us to? When it comes to defining a complex concept such as transhumanism, looking at real examples allows us to approach its meaning more practically. Neil Harbisson is the first cyborg recognized by a government. In the field of science, Kevin Warwich, with his cybernetic implants and theory about the arrival of telepathic communication, is another prime example. Both cases are described in depth in this first article on transhumanism in the present. 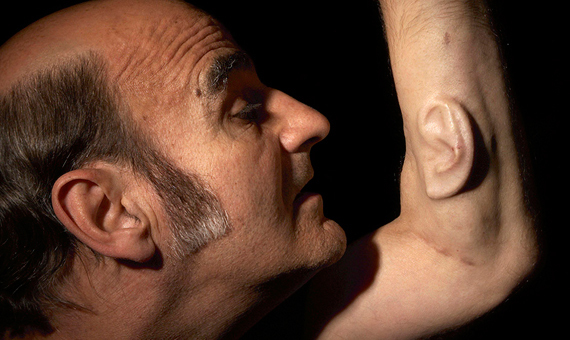 In art we find the figure of Sterlac, who has brought the ideas of transhumanism to almost another stage by implanting an ear on his arm, and a third robotic arm. Also stating that, “we reach a second level of existence where the body becomes the object for physical and technical experiments in order to discover its limitations”. “The ultimate goal of man and represents the impossible experience of explaining in words being elevated by grace, beyond humanity toward our total and transcendental realization of God”. “The human species can, if it wishes, transcend itself — not just sporadically, an individual here in one way, an individual there in another way, but in its entirety, as humanity. We need a name for this new belief. Perhaps transhumanism will serve: man remaining man, but transcending himself, by realizing new possibilities of and for his human nature”. In this conception Huxley maintains the concept but changes the meaning. Now transmuting has become a task undertaken by man with the help of science like psychology, biology, or engineering. Overcoming humanity is no longer dependent on the grace of God, but of overcoming humanity under technology as purely human work. A little later, in 1966, a first movement appeared that was considered transhumanist in itself, led by the philosopher and futurologist Fereidoun M. Esfandiary (known as FM-2030, because of his hopes of reaching a centennial on that date). He thought the technology at this time would have already advanced enough to allow him to achieve immortality. Esfandiary died in the year 2000 from pancreatic cancer; however, he is currently preserved by cryonics at Alcor Life Extension Foundation in Scottsdale, Arizona. Cyberculture began to become popular as early as 1988, and that same year the philosopher Max More founded the Extropy Institute and he drew up the transhumanist doctrine under the seven principles of: perpetual progress, self-transformation, practical optimism, intelligent technology, open society, information, democracy, autonomy, and rational thought. The enchanced man has arrived; the bionic man. Humans began to conceive technological tools and now those same tools will transcend biology. What will remain of these Homo sapiens when 50% or even 80%, of their biology is replaced by technological devices? A cloud-based society, which will know how to adapt to modern challenges better than other human beings. The rest of humanity will live anchored in biological needs, diseases, difficulty competing for a job, or for mere survival. Perhaps we are witnessing the thesis of historian Harari and we will take the step of the Homo sapiens to the Homo deus, with all that this entails. In order to reach this kind of “enhanced human”, transhumanism has focused mainly on the development of four strategic areas of knowledge known as NBOC, or what amounts to the same: Nanotechnology, Biotechnology, Information Technology and Cognitive Science. These disciplines will make it possible to leap into what the transhumanists have called “human enhancement”. We are no longer only talking about eliminating disabilities or curing diseases, but producing stronger, smarter, and happier beings. At the end of the day, it’s what human beings have always pursued. And that craving for transhumanists to achieve superintelligence, superhappiness and superlongevity should not be taken entirely as a joke. Google has and manages one of the largest databases in the world. In fact, the largest, which collects the personal preferences, interests, tastes, and even diseases of many of us. Google and other companies have been working for years on combining Big data with algorithms based on artificial intelligence, which are rooted in human behavior. Without going any further, last summer Watson, IBM’s supercomputer saved the life of a woman with leukemia, by comparing the patient’s genetic changes with a database of 20 million reports on cancer research in 10 minutes. 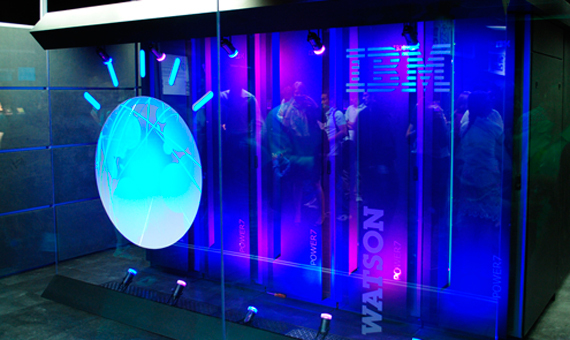 IBM’s artificial intelligence gave the correct diagnosis and suggested several appropriate treatments for the case. In relation to this superintelligence, and paraphrasing the transhumanist philosopher Nick Bostrom, if artificial intelligence manages to be developed, and human beings are voluntarily integrated with these converging technologies, we could eventually merge with this AI (artificial intelligence) and its abilities would become ours. And the third pillar, corresponding to superhappiness or superwellbeing, the philosopher David Pearce should be highlighted. Pearce is one of the people considering the possibility, like Peter Diamandis, that suffering can be eliminated and a state of abundance and happiness for all can be achieved. To this end, the necessary technology must be placed in the hands of international organizations, the scientific community and development aid organizations. The 2045 Initiative goes a little bit further beyond what we mentioned in the previous article on the future of transhumanism. The Avatar project is not just a science fiction story, like the James Cameron film with the same name. In this case it is a project of the 2045 Initiative, launched by a Russian billionaire Dmitry Itskov, with the aim of downloading the content of our brain to a data network to later become software, which can be represented holographically. In short, it’s clear that back in 1977 the writer J.G. Ballard didn’t know how accurate he was going to be with his article “The future of the future.” He probably couldn’t imagine that a few decades later Mark Zuckerberg would bring about the Facebook effect. The AVATAR project is no longer science fiction, or futuristic, and it does not still need to be approved. They already have the money, the brains, the technology, and they are working on it. They are now talking about another matter: “the matter of time”.